Want to impress with your freshly baked goods this Fall? Or look forward to a 100% friendly piece of toast for breakfast (Sesame Sunflower is my fave)? 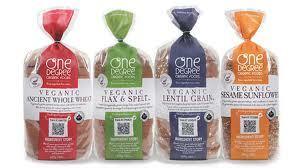 Award-winning One Degree Organics has your back. 1. What does veganic cultivation mean? It means that we grow food without any animal byproducts. We have chosen to eliminate this process of fixing nutrients in the soil, because we’re seeing more and more contaminants enter the soil from animal byproducts. 2. Is it the norm for local, organic farms to use toxic animal byproducts as fertilizer? It de pends on the crop and the location. The closer an organic farmer is to a cheap source of animal byproducts, the more likely those animal byproducts will be used on an organic field. The US Department of Agriculture (USDA) and likely the Canadian Health Food Association (CHFA) don’t require organic farmers to use organic animal byproducts in cultivation. They leave it up to the farmer’s discretion. So an organic farmer could use chicken manure from a nearby conventional chicken farm, where the chickens are pumped full of arsenic, antibiotics, and hormones, much of which is eliminated in their waste. 3. What can we do to change the rules? We’re using our purchasing dollars to try and push the market towards the type of crops we want to purchase. While lobbying the USDA and CHFA would certainly be an option, that type of process can take years. By sharing with specific farmers exactly what kind of crop we want cultivated for purchase, we can rapidly begin to change the type of crops that are in demand. 4. Most of your products are sprouted. What are the top benefits of sprouting? c) Elimination of potential allergens – whenever grains are sprouted, they’re repeatedly washed and soaked. This eliminates dusts, molds, and other contaminants that may cause allergic reactions, which are typically left on unsprouted grains.